The Danby DDR7009REE is an Energy Star® qualified, high capacity dehumidifier with a maximum water extraction rate of 70 pints in 24 hours. It is one of the best portable models on the market and particularly suited for use in a basement. Danby models have been widely praised in reviews by consumers across the country. Users value it for its ability to dry out wet basements and get rid of mold and allergen producing dust mites. Danby has managed to combine high quality, effective humidity control and a range of useful features in an appliance that is both affordable and easy to live with. Soft touch electronic controls make the Danby DDR7009REE simple to use while a reliable humidistat, continuous drainage and auto-restart combine to make this dehumidifier one you can set and forget. If this model has a weakness it is the noise it produces. Not all find it noisy but it is a little louder than some others in its class. With more power comes more noise and this unit will move 324 cu ft per minute. Air flow equals power. Compare that with other similar products and you will see that this is a muscular model. For those who find the noise intrusive there is a lower fan speed available so you can trade some of the power for quieter operation. The Danby DDR7009REE does everything well and nothing badly and we are pleased to recommend it to our visitors. This is a fully featured model and lacks nothing that might be needed or expected in a portable unit in its price range. The Danby DDR7009REE is portable, being equipped with castors for use on smooth surfaces and carry handles on each side for other movements. No model of this capacity is light but the DDR7009REE is of similar weight to its cmpetitors. At just over 43 pounds it is still a considerable weight for a small or elderly person. Where the Danby DDR7009REE scores is, first, its external dimensions are a little more compact than some others in its class, which makes it more manageable to carry and, second, it has two side carry handles making it easier for two people to lift, a feature which, regrettably, is missing from some other high capacity units. The DDR7009REE has an adjustable humidistat which allows relative humidity to be set anywhere within a range of 30 to 90%, one of the highest ranges we have seen. We recommend that the chosen setting is between 45% and 50% to prevent condensation, mold growth and to control the dust mite population. In order for the humidistat to be able to sample the air to measure the relative humidity the fan runs continuously, even when the compressor is not working. It also has an auto-defrost feature which enables the appliance to operate at temperatures as low as 41°F. The main purpose of auto-defrost is to protect the machine from damage. A sensor detects the formation of ice on the cold coil and turns off the compressor, the heart of the refrigeration process. The fan keeps running and the flow of ambient air melts the ice. Obviously the cooler the ambient air the more time the appliance spends in defrost mode and the less effective it is. While the unit will not be damaged it will remove much less moisture at temperatures below 60°F and will become increasingly ineffective. For this reason the DDR7009REE is not suitable for areas where the ambient temperature is below 60°F for extended periods. A valued feature of this model is continuous drainage. When the water collection container is full the machine stops working until the container is emptied. With continuous drainage a hose (not supplied) may be attached to an outlet on the appliance and run to a drain or sump into which the water can discharge. This facility is particularly useful if the unit is used in a space you may not visit every day. Taken together with the auto-restart feature, which re-starts the unit following a power outage, continuous drainage makes the machine entirely suitable for use in a basement, even more so if the basement is used for storage rather than being an extension of the living quarters. The Danby DDR7009REE incorporates soft touch electronic controls which users report are easy and intuitive to use. For greater convenience the unit is also equipped with remote control which is effective at ranges of up to 16 feet from the appliance. Two fan speeds are available on the DDR7009REE. Selecting the lower fan speed will reduce the rate at which moisture is removed from the air but will also lower the noise level. On first purchasing a dehumidifier is is advisable to use full power to reduce relative humidity to the preferred level. Once this is achieved you may safely reduce the fan speed if the noise is intrusive, especially at night. The DDR7009REE also includes a 24 hour timer so that you may programme it to come on and shut down again as required. An example of how this facility is used is to set the timer to switch the unit on as people get up in the morning. The appliance then operates at a time when showers are being taken, kettles boiled etc. It then runs for a pre-set number of hours to remove the excess moisture and then switches off again to save energy. In the many consumer reviews we have read there are no complaints about the effectiveness of the DDR7009REE. It is highly rated for moisture extraction and for dealing with mold growth and musty odors. There are some complaints about the fan running continuously. Danby make it clear that the fan runs continuously to enable the humidistat to sample the air and sense the level of relative humidity. The energy cost is low. Continuous running gives a more accurate measure than periodic sampling, a technique used by some other manufacturers. On balance the energy savings tend to be greater using this method but if it irritates another brand may be preferred. A number of reviews questioned the accuracy of the humidistat. Danby state that the humidistat is accurate to +/- 5%. This is typical of portable models generally and we recommend monitoring relative humidity with a separate hygrometer and adjusting the humidistat accordingly. Customers who use the bucket report that it is easy to remove and replace but a little flimsy. Those who use continuous drainage found this works well. A few reviewers complained that the unit heats the air. It is a characteristic of all dehumidifiers that the air they return to the room is two to three degrees higher than ambient temperature. Complaints about the noise level produced by this unit were common. Few problems were reported about the reliability/longevity of this model. 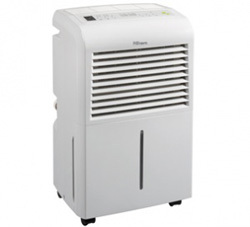 In our view the Danby DDR7009REE is one of the best dehumidifiers available in its class. Noise levels are always higher from more powerful machines but there are comparable models available that are a little quieter. Designers have to balance each desirable characteristic against an undesirable one; robust construction vs greater weight, for example. If your priority is for the quietest possible machine another brand would be preferable. If the other qualities of the Danby DDR7009REE Dehumidifier are more important to you we would recommend this unit without hesitation.